A few years ago, after the birth of our second child, my husband and I were trying to decide whether or not it would be possible for me to stay home. At first we thought that since we were just about breaking even, there was no way we could ever make it happen. But when we decided to actually put pen to paper and calculate our bottom line with and without my salary, we were quite surprised. What we found was that it was actually costing us to have both of us working. While that may not be the case for everyone, you may find that the second salary brings in much, much less than you think it does. According to Jan MacGregor, a financial consultant and former analyst, "There are people out there who are expecting to be able to meet their bills better (after they re-enter the work force) and never realize they are either working for a loss or for something like $4,000 a year (after expenses)." That may seem hard to believe, but if you consider the many "hidden" expenses of a two-income household it is often the case. There are, of course, the obvious expenses such as child care and commuting costs. 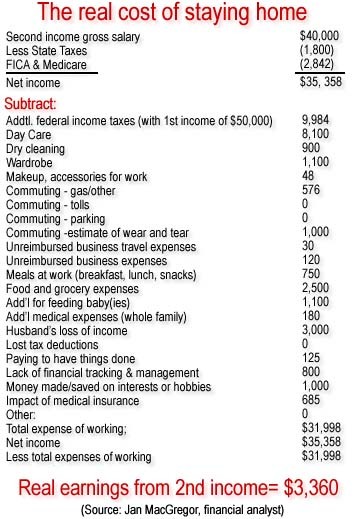 Some of the hidden expenses are the money spent on lunches, more take-out and convenience food for dinner, dry cleaning bills professional clothing. There can be higher medical costs due to increased exposure to illnesses for children who are in daycare. Many families hire a housekeeper or gardener to keep up on the household work that they don't have the time to do. A significant factor is your taxable income. A second salary can push your taxable income into a higher tax bracket. While the tax issue in and of itself does not eat up the entire second salary, when you add in all the other expenses of a two income family, you might find that it's not worth it to have both parents working. If you are considering having one parent stay at home, the best thing to do is to actually calculate your income and expenses, taking into consideration the difference in taxation. You may find that you can in fact afford to stay home with your kids.